The NFC Academy curriculum for the print program is the biblical worldview curriculum, LIFEPAC. All subjects are covered with a consistent scope and sequence to ensure your child receives the best academic program for your homeschool. We will ship all of the curriculum to you which will include the student books, teacher guides, and the specially developed NFC Academy Daily Lesson Planner to guide you each day in your program. We will assign you one of our experienced teachers as your Resource Teacher to answer your questions that arise during the school year. Students love this motivating Christian curriculum which gives them a sense of accomplishment as they complete each worktext! ​LIFEPAC worktexts include engaging lessons, activities, review questions, and tests. Scripture passages are integrated throughout worktexts to help students connect daily learning to biblical truth. Students will enjoy this look at history as they see how God has worked throughout time. LIFEPAC History & Geography develops students' understanding of and appreciation for God's activity as seen in the record of man and his relationships. The LIFEPAC History & Geography worktext-based curriculum targets this goal by focusing on six major themes: Geography (World and American), History (World, American, and Religious), Government, Citizenship, Economics, and Social Sciences. ​Each Bible-based language arts worktext offers a mix of colorful illustrations, easy to follow lessons, and ample opportunity for both oral and written practice of new skills. LIFEPAC Language Arts covers the six major content strands of reading, speaking and listening, writing, spelling, grammar, and composition. The program also covers topics like visual media, the history of the English language, the Bible as literature, and book reports, as well as study and research skills that are grade appropriate. ​The LIFEPAC Math 10-Unit set contains ten full-color worktexts made especially for young learners. LIFEPAC Math develops and builds math skills through the use of various question formats, multiple exercise techniques, and fun learning games. This motivating math curriculum prepares students for using math successfully in real-life situations. The curriculum targets this goal by focusing on the major themes of number skills, geometry, algebra, data analysis, and probability. ​The LIFEPAC Science 10-Unit set contains ten full-color worktexts made especially for young learners. LIFEPAC Science focuses on the development of observational skills as they study the physical universe God created. The four major strands of this curriculum include Life Science (plants and animals, human anatomy and personal care, biology), Space and Earth Science (geology, weather, space), Physical Science (chemistry, physics), and the nature of science (scientific method, experimentation, technology). ​The consumable worktexts in this LIFEPAC curriculum for Elementary grades 3-5 are packed with essential grammar and composition skills, including instruction in story development, poetry, written reports, word usage, reading fluency, and more. The worktexts contain all of the reading assignments so no need to keep up with a number of different books. But if these print-based worktexts are thorough, does that mean they're also easy to use? Absolutely! Their colorful, step-by-step format can keep your elementary student’s attention and help him become an independent learner. And each ultra-thin worktext in this biblical worldview curriculum can be finished every three to four weeks, so your student will feel a great sense of accomplishment. ​Students continue or begin their language-learning adventure in Elementary (grades 3-5) starting with Spanish I (version for grades 3-5) and then move on the next year to Spanish 2 (version for grades 3-5) The content for each unit provides a fun and interactive experience for students and is based on an authentic story, myth or legend from various Spanish-speaking cultures. Although the course focuses primarily on vocabulary acquisition, basic grammar principles are intuitively grasped through stories, games, activities, songs and assessments. 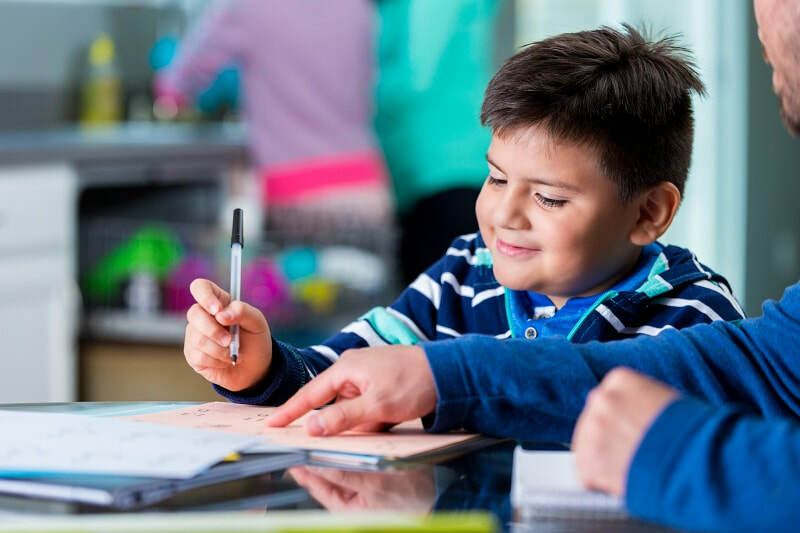 Notice: The use of the NFC Academy Daily Lesson Planner is only for those families with actively enrolled students in the NFC Academy Print Program. The NFC Academy Elementary Daily Lesson Planner lays out each day's work to get you through the year without concern about the pace. Your NFC Academy Daily Lesson Planner is your guide to use so you stay on schedule. It lays out all work that is done in each subject for each day of your school year. When a student’s school year is set it includes the holidays typical to a school setting. Major holidays include Thanksgiving, Christmas break, Spring Break and for those who work in the summer, a summer break. There are other one day holidays like Labor Day, Veterans Day, MLK Day, Good Friday, and Memorial Day. All of these are a part of the calendar so if your family wants to take a break during these holidays you can and still be on schedule to finish as you plan. Of course, you can also have homeschool during those days if you select to do so. NFC Academy does offer an acceleration of math studies in the elementary grades when the student is ready. When the student is performing above the average in all their courses and significantly above the average in their math class the student may qualify for the acceleration of math at any year in the elementary grades. Parents may request accelerated math for their student, and we will work together in reviewing records and performance to determine how to best meet this request. The typical goal for accelerating the math studies is the long-range look toward taking advanced math courses in high school. As we work together, we will provide the options that may accomplish such a goal. Want to make your science experiments easier for you and your child? Consider purchasing a Science Kit for your 1st-5th grade science experiments in our print program. You will not need to shop for your own supplies as they will be right there for you. For those in grades 4-5 you have another option of purchasing our DVD that demonstrates the science experiments using the supplies to conduct the experiment. We will keep all of your official records for you. As you complete each semester of study your NFC Academy Resource teacher will help you complete the semester grade report which you submit to the Academy. You will have access to the report cards for the year using your Parent Portal in our RenWeb management system. The final NFC Academy Elementary Report Card will be sent to you from the Academy Office. As you follow the NFC Academy Daily Lesson Planner you will be meeting the typical requirements for regular attendance and we will be able to confirm that as you communicate regularly with your Resource Teacher. When do you want to start your school year? NFC Academy operates school year-round and you can start on your schedule that works for you. We set-up every student with the typical school year of 180 school days no matter when you start. As we noted in our Daily Lesson Planner your school year will have holidays built into the school year, but it is up to you if you take those days or work those days. We are ready to start your school year when you tell us it is time to get started. Take a tour of our 3-5 Print Program with this video we have prepared for you. You will see how our own NFC Academy Daily Lesson Planner works allowing you to focus on each day's lesson plans. It will keep you on track to finish your school year on time. Some states require some form of annual standardized testing for homeschool students. Typically, a test must be called a norm referenced test and not one similar to the various state created tests. To enable our families to meet this requirement and to help us evaluate our academic program we make the Stanford Achievement Test Online available for our students.